"At Lemon cove we were very near the present hiding place of Jim McKinney, a famous outlaw and desperado who shot 5 men at Porterville a few days ago. He has a friend here (at Lemon Cove) who is believed to be feeding him in the thicket along the river. We saw his little dog several times and saw the man who is supposed to be attending to him. And we ran across a deputy sheriff in a little building. He had been out all night searching and is keeping out of sight daytimes." "Oct. 16, 1902. Clear and warm; partly cloudy pm and evening. Drove up Kelso Creek 10 miles above Weldon and back over a very heavy sand road, making 28 miles for the round trip from Onyx P.O. Then sent my team back to Kernville and hired a young man (S. H. Plumley of Onyx) to drive me over Walker Pass to Indian Wells, 30 miles farther, driving all night till 2:30 in the morning, in order to catch the 4 am stage at Indian Wells to go to Owens Valley. A curious thing happened. Yesterday morning at Kernville I hired the team and driver for the trip to Indian Wells. But last evening he heard that Jim McKinney, the murderer who shot several people at Porterville last August and who was hiding at Lemon Cove when I was there (see Vol. 1 p. 72a) is now camped in Walker Pass and he recently held up several teams. He (my driver) is afraid and backed out of driving me over the pass. He is still more alarmed over a somewhat odd circumstance namely that two men with a heavy bundle (apparently containing Winchesters) who were at Caliente when I was there and who took the same stage to Kernville (and one of whom got off where I did and spent the night there), followed me up the valley yesterday in a buggy, apparently aiming to head me off, and were obviously taken aback when in one of my zigzags across the valley I suddenly confronted them. They went on up toward the Pass and my driver feels sure they are “laying for me” up there. I told him I have very little money and am entirely willing and anxious to risk it, but he is of another mind and declines to go. At this unhappy juncture a young man (Indian) named S.H. Plumley, who lives 6 miles above Onyx, chanced to come along in a buggy and I succeeded in hiring him for double pay ($10.00) to drive me over." Despite the headline, the infamous James McKinney eluded justice in July 1902, leading to Merriam's run-in later in October. "Jim McKinney was shot and killed at Bakersfield, California, April 19, 1903. He killed several more men between the time I first struck his trail and the time he was killed." Merriam had a tendency to state the facts and not dwell on danger too much in his writing. The casual way in which he presents his close encounter with a known murderer and outlaw speaks to Merriam's demeanor. 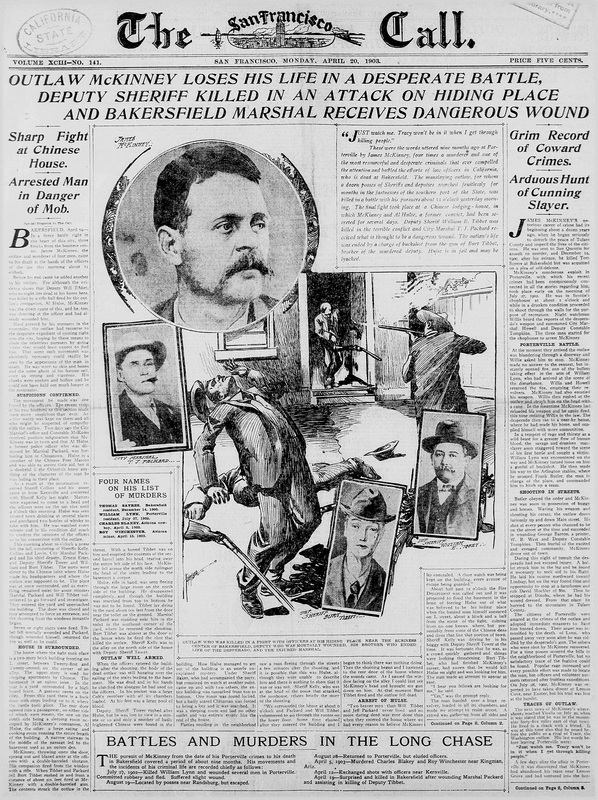 Left: An article from the San Francisco Call, dated April 20, 1903, reports the death of outlaw James McKinney as well as Deputy Sheriff William E. Tibbet and City Marshal TJ Packard, who both died from wounds sustained in the shootout. Deputy Sheriff Burt Tibbet, brother of the slain deputy, shot and killed McKinney in the fight and McKinney's associate was later caught when he fled the Bakersfield Joss House (Chinese Temple).